I never had the pleasure of meeting my Uncle Pat, you see the war took him back in 1966. My oldest sister Barbie was the only niece from my dad he ever met, and she was just a baby, so she has no memory of him either. Brenda and I had never met him, but that doesn’t stop the tears from running down my face as I type this blog and it doesn’t stop the emotions from erupting from my heart as I edit the pictures of the articles my Granny clipped from the newspapers long ago. To read the words quoted from my daddy as he spoke of his only brother and to see the pain of losing a loved one in the faces of my dad, Granny, and aunts has taken its toll on me today. 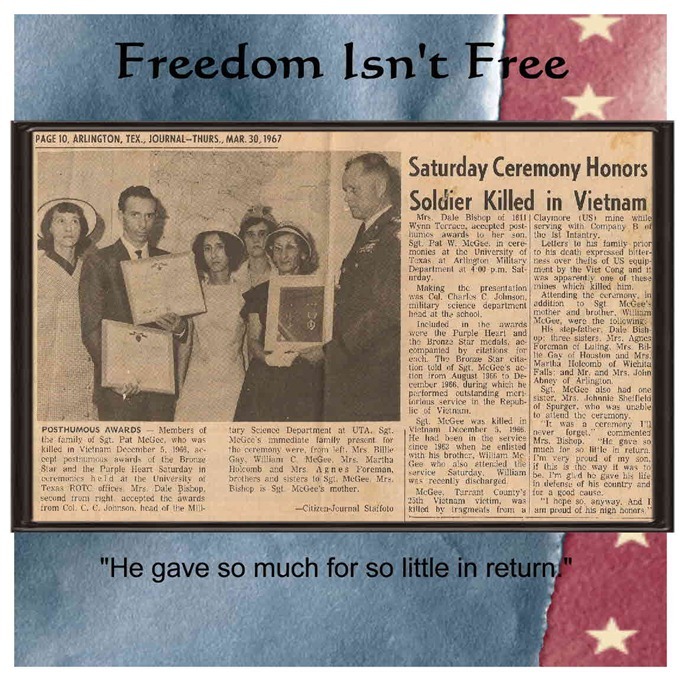 I am writing this blog for Memorial Day. The day that was set aside to remember that some gave all. 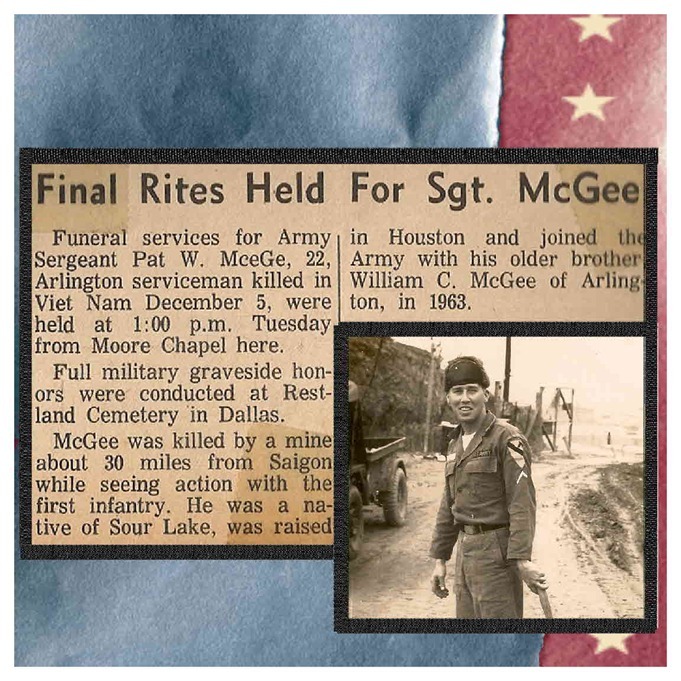 My daddy, William C. McGee, had already served one “hitch” in the army. When he got out, he and Uncle Pat worked in construction for a while. Work was scarce one winter so January 1963 they decided to enlist together. They were stationed together for a while in Korea. 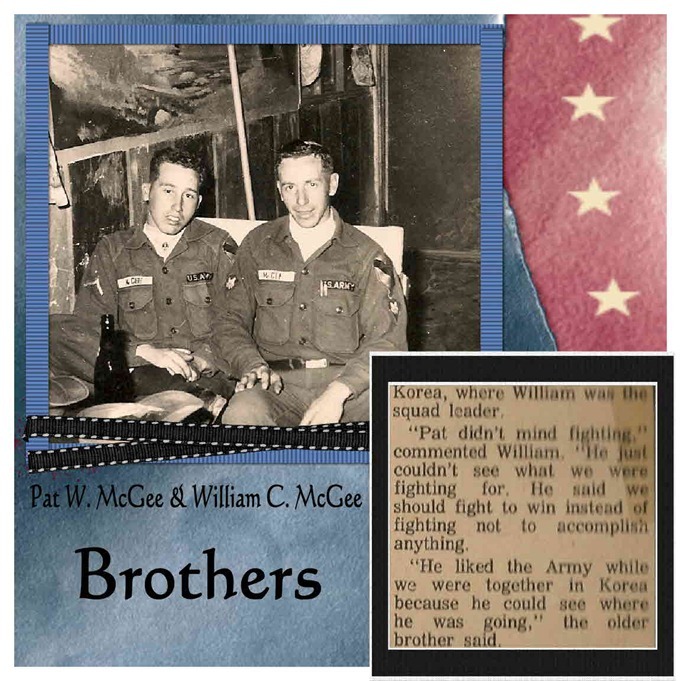 “He liked the Army while we were together in Korea because he could see where he was going.” My daddy informed the newspaper. I can only wonder how many more mothers received this sort of notice to tell them their baby had been killed in a war, a war that didn’t make since even to those fighting it. A war people remember as Vietnam. 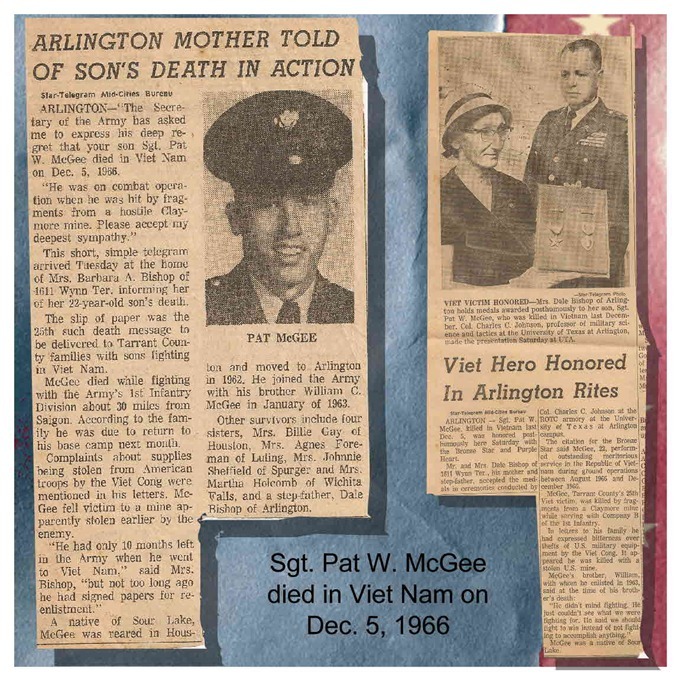 “Pat didn’t mind fighting, he just couldn’t see what we were fighting for,” my daddy told the reporter. 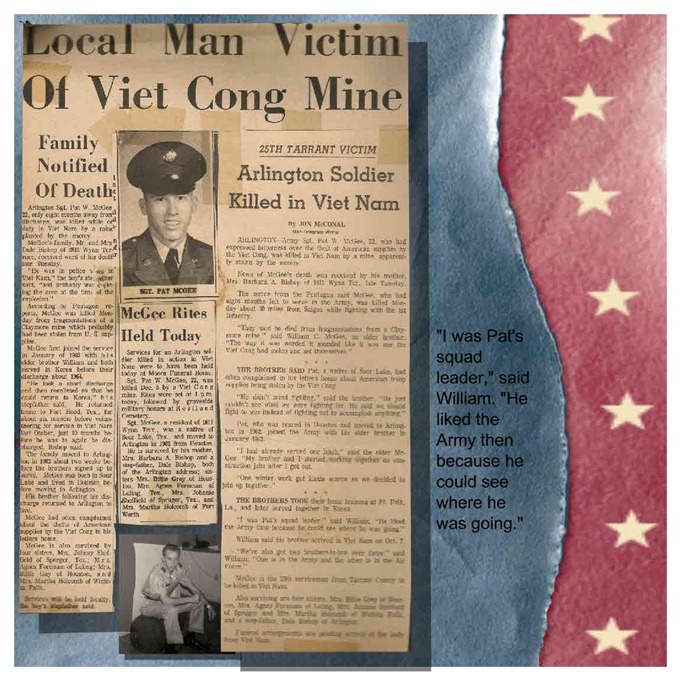 Uncle Pat was about 30 miles from Saigon when he was killed by the mine. Apparently it was a U.S. mine that had been stolen by the enemy and used against our troops. Uncle Pat had complained about the theft of American supplies by the Viet Cong in some of his letters home. Four score and seven years ago our fathers brought forth on this continent, a new nation, conceived in Liberty, and dedicated to the proposition that all men are created equal. Now we are engaged in a great civil war, testing whether that nation, or any nation so conceived and so dedicated, can long endure. We are met on a great battlefield of that war. We have come to dedicate a portion of that field, as a final resting place for those who here gave their lives that that nation might live. It is altogether fitting and proper that we should do this. But, in a larger sense, we can not dedicate – we can not consecrate – we can not hallow – this ground. The brave men, living and dead, who struggled here, have consecrated it, far above our poor power to add or detract. The world will little note, nor long remember what we say here, but it can never forget what they did here. It is for us the living, rather, to be dedicated here to the unfinished work which they who fought here have thus far so nobly advanced. It is rather for us to be here dedicated to the great task remaining before us – that from these honored dead we take increased devotion to that cause for which they gave the last full measure of devotion – that we here highly resolve that these dead shall not have died in vain – that this nation, under God, shall have a new birth of freedom – and that government of the people, by the people, for the people, shall not perish from the earth. President Abraham Lincoln November 1863 stating that Uncle Pat had given the “last full measure” of devotion, he gave all. 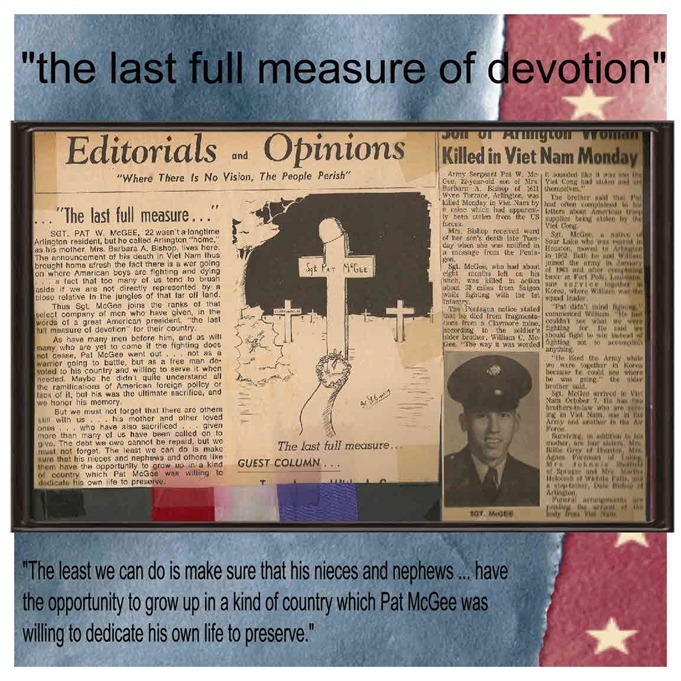 Thank you Uncle Pat, your nieces and nephews and great nieces and nephews will never forget you or your sacrifice you gave so that we and others can have the freedom you fought and ultimately died for. 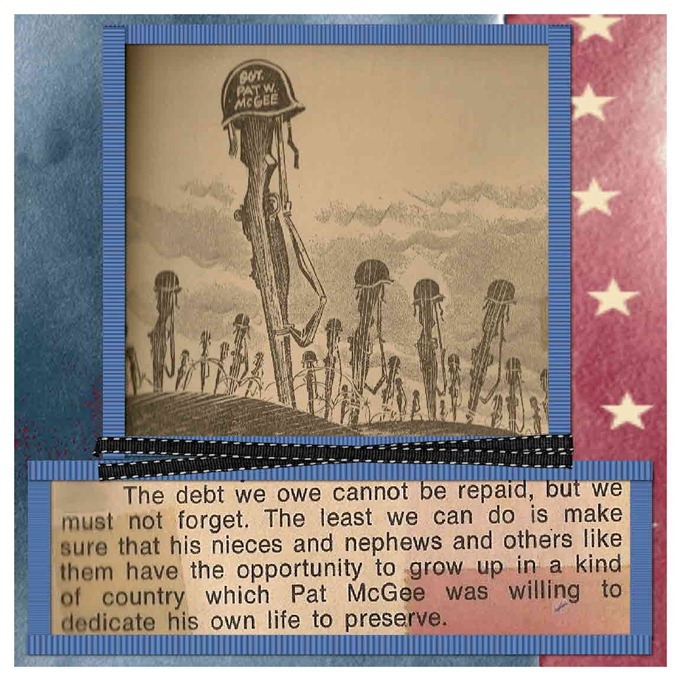 Posted on May 30, 2011, in Inspirational and tagged Korea, Memorial Day. Bookmark the permalink. 2 Comments.